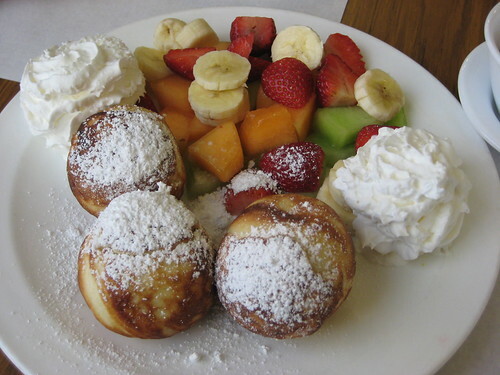 Aebleskivers and fruit at The Little Mermaid restaurant. Happy Holidays! Sam and I spent the last few days driving up and down the California coast (between Los Angeles and Monterey), and one of our last stops was the quirky town of Solvang, CA– it’s supposed to be a little slice of Denmark, but turned out to be a melting pot of Danish, Dutch, Belgian… you know, European places where you expect to find blonde people with charming accents. 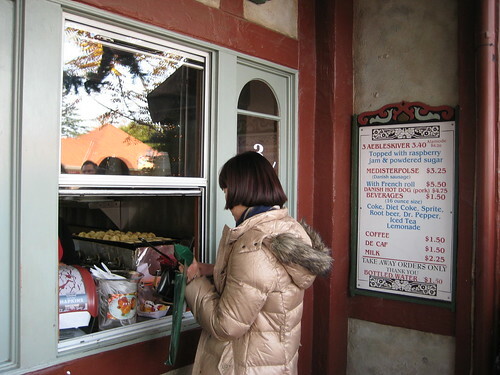 Everywhere I go, I like to try whatever food is considered the specialty. 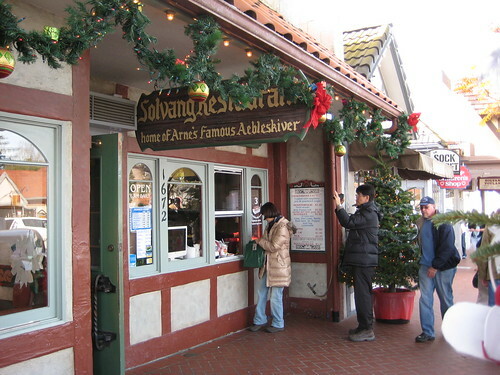 In Solvang, it’s the aebleskiver– a spherical pancake. 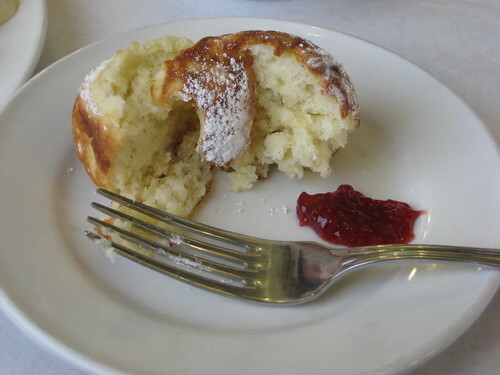 We sampled aebleskivers from not one, but TWO local spots. For $6, we got a plate of three aebleskivers, with whipped cream and fresh fruit. We also got a little bowl of raspberry jam, to accompany our dough-balls. Now you can see the pans. 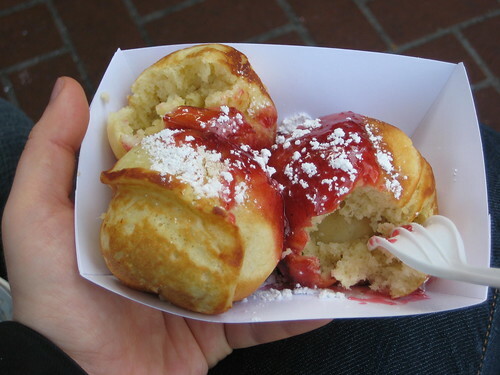 For $3.40, you get three aebleskivers in a food truck-esque paper container. Arne's famous aebleskivers. Supposedly invented by some Dane back in history. 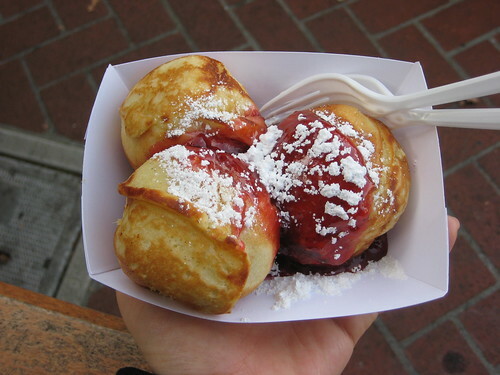 I expected aebleskivers to be like donut holes– greasy, sticky, etc. But they were actually light and fluffy. 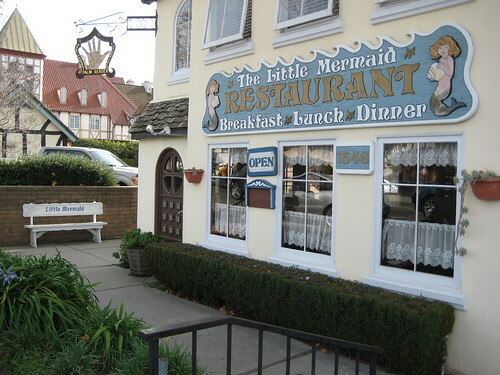 The ones at The Little Mermaid were in some places a bit crisp on the outside, and if this had been a contest they might have won, by a narrow margin. I liked that one of my Arne’s aebleskivers had a little pocket of air in it. In case I don’t blog again for a few days… Happy New Year! In 2012, I’m going to make my own frozen yogurt! Watch out, world.